I did manage to pass the FE exam. There is no way in the world I could have come close to passing it if I only studied on my own. Thank you for this course as it helped tremendously. Having been out of college for nearly 14 years it was invaluable to have this course at my disposal. I just checked and I passed! Not bad for being out of school for 11 years! Thank you Test Masters and Thank You Lord! I passed the exam. I want to thank everyone at Test Masters for their help. The class is exactly what I needed to pass. 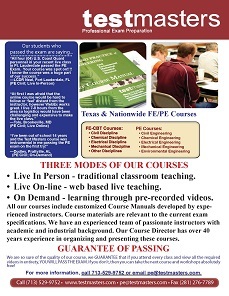 Test Masters knows the strategy and focuses on material to pass the test. I would like to thank you for the great review course. The course hit the parts of the exam I needed to spend more time on. I passed!! I feel I learned more in your course than I did in my college classes. I passed the EIT this past October and I want to thank test masters and all of the instructors. I could not have done it with out the seminar and help from all of the instructors. I passed the EIT/FE October 2007 exam. I wouldn’t change anything with your course. I think it’s great the way it’s setup now. I passed. I think your class helped me to organize my thoughts since I graduated in 1987 (so over 20 years ago). I have passed the FE exam! I was upset for leaving many questions blank in both sections, but the course preparation was so good that I passed it anyway on my first time. Thank you so much for your class. I did in fact pass the FE exam! I know it was your class that helped me pass the exam. Thank you for all your help. I thank you and all the professors at Test Masters for the wonderful job you all did teaching the EIT review course. I received a passing score thanks to Test Masters. Thank you again for coming to Columbia, SC. Yee!! Ha!!! After 19 years practice, multiple tries at the FE exam, and two review courses (one to them being Test Masters Fall 2007 course), I am proud to say that I have passed the FE exam. I slept only 2-hours the night before the exam. During the exam one all I could think of was doing the best I could possibly do in the morning half because I knew the afternoon session would be rough on little sleep. Thanks Test Masters for your thorough review course. I would recommend it to anyone! I received the results and I passed. I think the class made a huge difference and it really helped me a lot. Once again, thanks for your help and I’m looking forward to take the P.E course with Test Masters. I would like to say that the Test Masters helped build my confidence up, I felt comfortable going into the exam and leaving the exam. Thank You. Yes, I did receive my results on the 22nd of December and I PASSED!!!!! Thanks for all Test Masters help. I couldnt have done it without you guys. I received a letter that I have passed the FE exam !!!!!!! Thank you to you and your staff of teachers for the tutoring and in depth studies. I did receive my results and was pleased to find that I passed the exam. The testing techniques in particular proved very helpful. The course was very instructive and directly helped me pass the exam. A very nice way to enter a new year. After being out of school for nearly 5 years I know that I could not have passed without your course. I consider such a review course essential.